Its a beautiful, beautiful day. You know why? Because, a woman forced laborer who I had recently reported about, has just been set free by her employer. Here's the story of her release. You can also read it in the website of IPS News - the media outlet where my story had first appeared. The first time I met Sri Lakshmi, she was climbing a flight of stairs in a half-constructed building in the residential area of Vanasthalipuram, in the South Indian city of Hyderabad, carrying a stack of bricks on her head. She was a forced labourer, who received no payment for her work. That was in mid-April. Last week, I met her again. This time, she was carrying something entirely different: a school bag that belonged to her four-year-old daughter Amlu. Lakshmi was a free citizen and Amlu was going to school for the first time. Separating our two meetings is a story that was published by IPS entitled ‘No Choice but to Work Without Pay’. It was this article that stirred action on the ground, paving the way for Lakshmi’s release. Though I hadn’t reported on the issue before, I was excited about a series IPS was putting together on the growing menace of forced labour worldwide. I began by reaching out to activists in my region who work with daily wage labourers and rescue many forced workers. I spoke with people employed in brick kilns, on paddy farms and in individual homes as domestic help. My own neighbourhood of Huda Sainagar, close to Vanasthalipuram, had been witnessing a construction boom, with over a dozen buildings being constructed every day. Every now and then I would see groups of people being brought in trucks and ‘unloaded’ – like cargo – at the construction site. There were men, women and small kids. Some of them went back quickly, while others built makeshift tents out of polythene sheets and lived there. Usually, these were the forced labourers who had no fixed ‘work hours’ and toiled all day, from dawn to dusk. Once day I saw a very small child washing plates near a shack. The next day, she was washing clothes. Her hands were so small she couldn’t hold the soap in her hands. This was Amlu, daughter of Lakshmi, a Dalit woman who worked in a nearby building. I had to wait until it got dark to speak with Lakshmi, as her employer didn’t allow her to take a break or speak with anyone. When we did speak, she told me that she was working against her will and that she wasn’t paid any money for her labour. Though the focus of my story was forced labor, I was also equally drawn to its consequences. It was clear to me that if Lakshmi continued to labour in this way, Amlu would not go to school and would soon become a child labourer herself. This really distressed me. So I did what I usually do in such situations: reminded myself that I was a storyteller who gave a voice to unheard people. And I filed a story. Being a huge fan of the reach of social media, I always track the impact of IPS stories, which often travel far and wide across countries. As this particular story traveled on twitter, it reached a local journalist in Hyderabad, capital of the South Indian state of Telengana, who shared it with his friend, who is a doctor and a human rights activist named Veerappa Naidu. 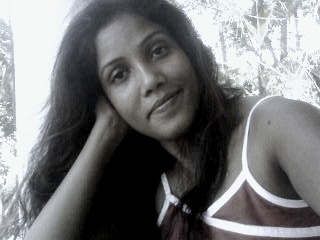 Last week, I received an email from Naidu, in which he confessed to being greatly disturbed to hear of Lakshmi’s plight. So he, along with two of his local friends, sought out Lakshmi’s employer – a real estate developer – and confronted him. The result was better than could have been expected: the employer released Lakshmi from forced labour and paid her 10,000 Indian rupees (approximate 200 dollars). Naidu and his friends then helped Amlu get into a government school, where she can study for free. 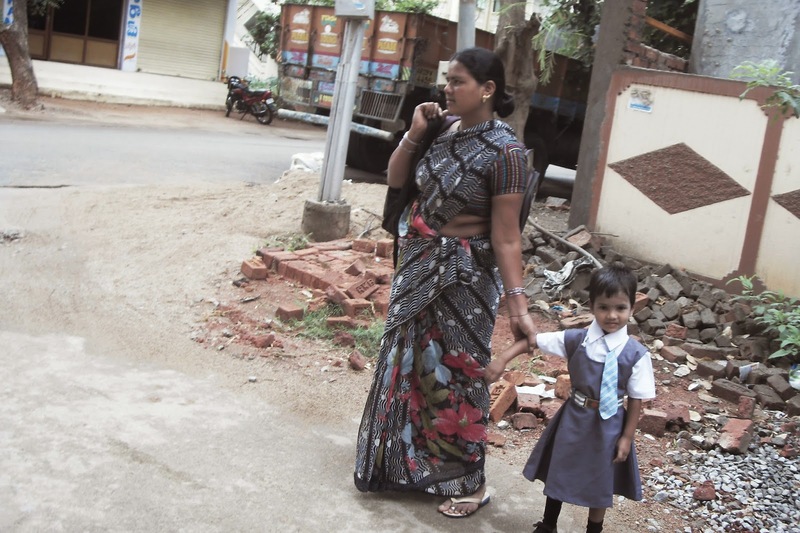 Since being released, Lakshmi has found a job as a nanny in the same neighbourhood. Amlu’s hands haven’t grown much in the few months since I first met her, but they are now holding books and pencils. “I love to draw,” she told me, holding up a coloured pencil. Lakshmi has used part of her 10,000 rupees to buy Amlu a uniform, a pair of shoes and a school bag. And every day, at nine a.m., she takes Amlu to school – a place she never had the opportunity to go before. “I am thankful to everyone who has helped me get out (of forced labour) and has helped my daughter to attend school,” she told me. As a journalist, I have always believed that media can be an effective tool to bring about social change. This story has just deepened my faith.